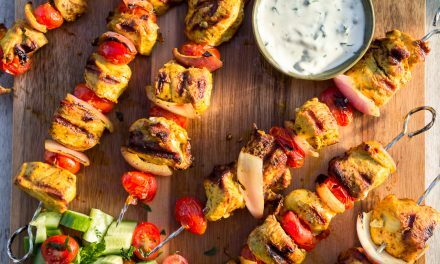 A delicious Whole30 and Paleo meal is never far away. You just have to know where to look! Chicken Jardinière is a perfect example. 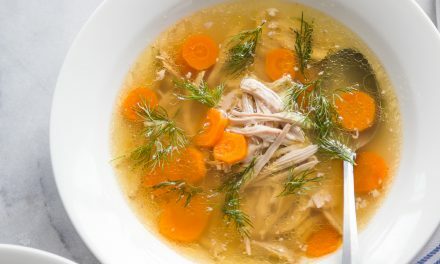 Take some simple, everyday ingredients, prepare them thoughtfully with basic techniques, and you are treated to most incredible pot of soul-warming, comfort food. Unless, of course, you’re not a fan of chicken. In which case, make this Beef Stew instead! Every now and then, I head over to YouTube for some R&D. I like to see what people are cooking, what’s trending, who’s leaving rude comments on my Shakshuka recipe! Then, without fail, I will type the words “Jacques Peppin” into the search bar and watch everything the internet has to offer. Even if it’s something I’ve already seen 32 times (watching him make an omelette never disappoints), I still watch in awe as the man who literally wrote the book on technique cooks the most perfect food. One night, as I lay there clinging to every word he was saying, I came across a recipe of his I had never seen before. It was titled ‘Chicken Jardinière’. ‘Jardin’ means garden in French. 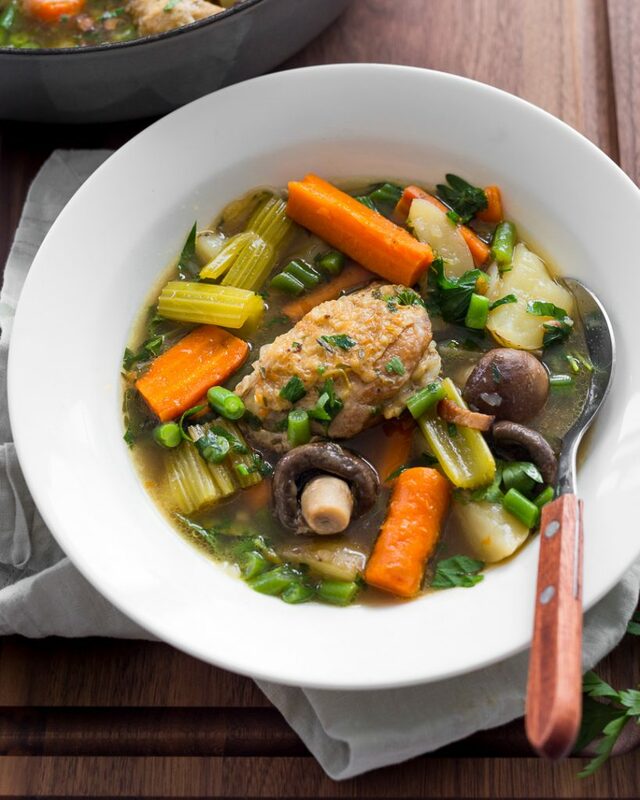 He explained it was a French chicken stew with plenty of vegetables that reminded him of his mother. 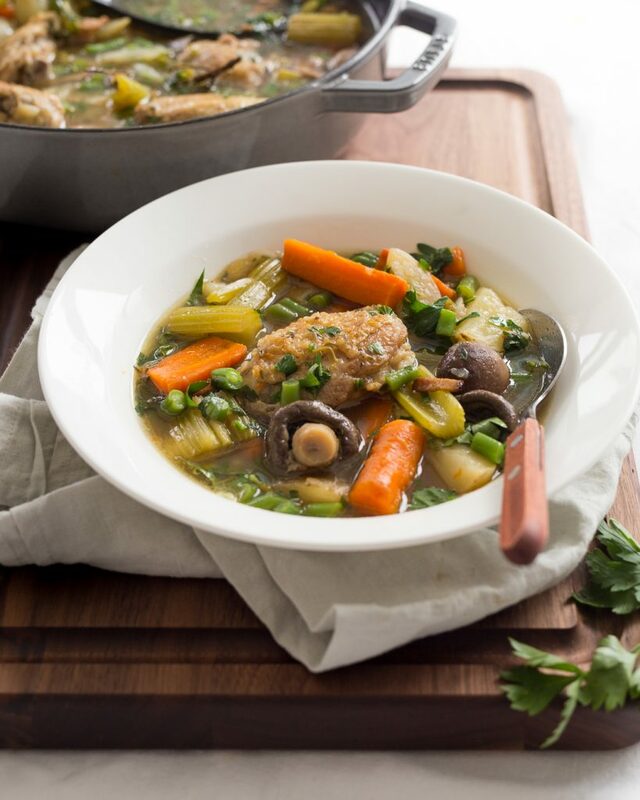 I love a good rush of nostalgia as the next guy and, funny enough, one of my mother’s signature recipes is Chicken Jarkoya (a Russian chicken stew). Turns out Jacques and I had something in common! Is it Ok if I call him Jacques? The timing couldn’t be more perfect! Cold winds were starting to blow across the waters of Lake Ontario and we were getting our first taste of Autumn. 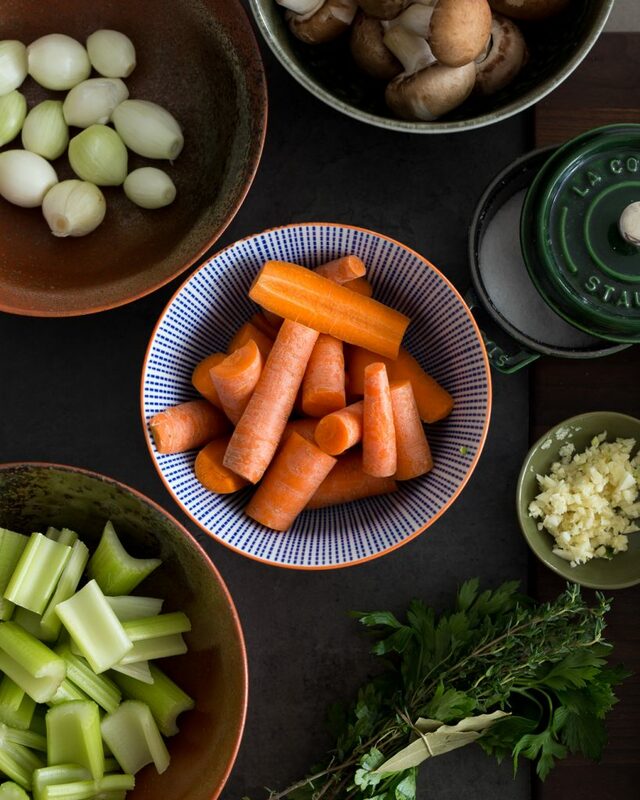 What better way to prepare for the months ahead than to learn a new stew recipe? Even better, I knew this Chicken Jardinière was perfectly suited to a few Whole30 and Paleo adaptations. Even, even better, I was (still am) currently on a round of Whole30 and needed something to eat! Chicken Jardinière seemed to focus on the chicken and vegetables. Nothing more, nothing less. 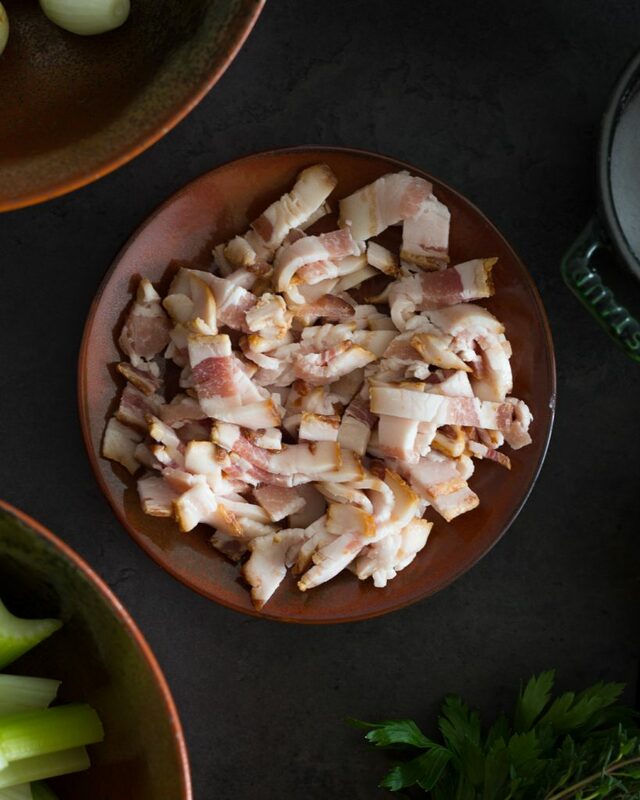 Jacques’ recipe kicks things off with some pancetta for flavour. Nothing some sugar-free bacon couldn’t take care of! It called for a bit of flour to help thicken the stew. No worries, I thought! Arrowroot starch will solve that problem! Then, in went the usual suspect: a heavy pour of white wine. Hmmm, I thought! Chicken stock to the rescue! Lastly, some green peas were added around the end to add some texture and colour. What about some finely chopped green beans instead?! The next day, I set off to the store to gather my ingredients. Excitement rushed over me. I was pumped! It’s always an amazing feeling to cook something new. I always know I will make it again for testing purposes so I let myself get completely immersed in the recipe the first time around. I cranked up the Edith Piaf and Charles Aznavour on my Harmon Kardon, and poured myself a tall glass of fizzy water (what? I’m on a round of Whole30!). I cooked and channeled my inner Jacques! Even stopping to post a little teaser of what was to come on my IG stories! I got more than a few messages from some impatient viewers that day! “Coming soon,” I said! The stew turned out exactly as I had hoped! Delicious, comforting, warm, hearty. A perfect meal for fall. I was happy as a pup with two tails! Even happier that I didn’t take any measurements so that I would have no other choice than to cook it again! I hope it’s OK if I call you that! 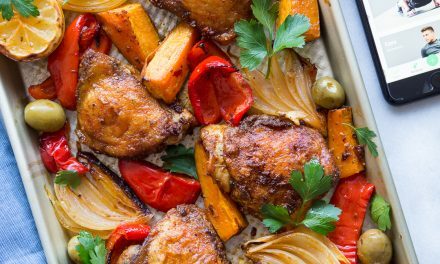 This Chicken Jardinière is a Whole30 and Paleo adaptation of Jacques Peppin's original recipe. I'd like to think it's every bit as delicious. Preheat a Dutch oven or braiser over med heat. Add bacon and cook until crispy. Transfer cooked bacon to a plate and set aside. Reserve bacon drippings in pot. Rinse and pat chicken dry with paper towel. Season both sides with kosher salt. Add chicken to pot and brown both sides (approx. 8-10 min total). Add chicken stock, carrots, celery, onions, mushrooms, garlic, and potatoes. Tie the thyme, parsley and bay leaves with butcher's twine to make a bouquet garni. Add that to the pot as well. 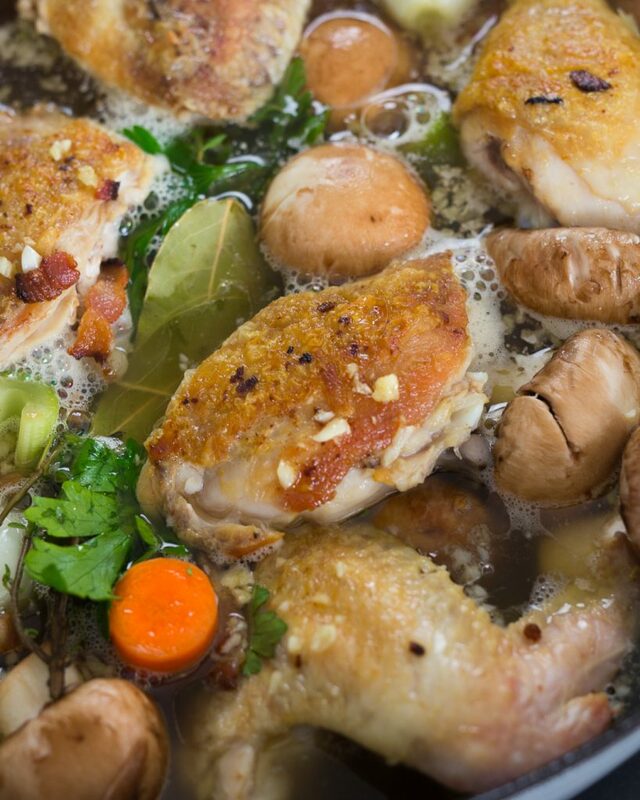 Nestle the vegetables and herbs in the broth and arrange the chicken so that it is skin-side up & partly submerged. Season stew with a bit more salt and pepper. Bring stew to a simmer, drop heat to low, cover with a lid and cook 20-25 min or until chicken is cooked through. Add arrowroot starch and 1.5tbsp cold water to a small bowl. Stir until well combined. Add to stew and stir through to thicken. Add green beans and cook additional 5 minutes. Add parsley and stir through. Serve in individual bowls and garnish with extra parsley.